Erich M. Niederlehner, has just completed a free ebook on Bankruptcy and encourages anyone considering filing for bankruptcy or just wants to know more about Bankruptcy to download and read the free ebook. Erich M. Niederlehner, currently has offices in Pensacola, Fort Walton Beach and Panama City and has been practicing Bnkruptcy law for 14 years in the Gulf Coast Panhandle. 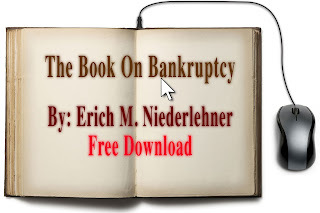 Go to www.ShouldIFileForBankruptcy.com and download the free "Book on Bankruptcy" by Erich M. Niederlehner today or click on the image above.